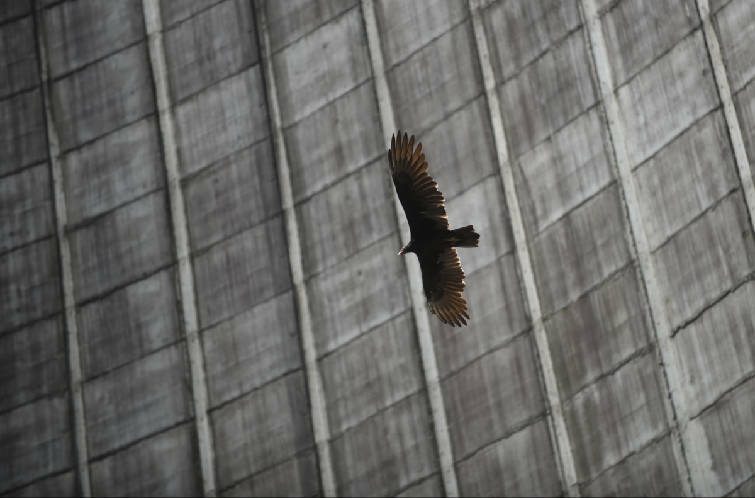 The cooling towers are visible from the roof Wednesday, Sept. 7, 2016, at Bellefonte nuclear power plant in Hollywood, Ala.
A turkey buzzard flies through tower 2 Wednesday, Sept. 7, 2016 at Bellefonte Nuclear Power Plant in Hollywood, Ala.
Nearly a half century after the Tennessee Valley Authority assembled a riverfront parcel in Northeast Alabama to build what was supposed to be one of its biggest nuclear power plants, the federal utility is giving up the project and selling the 1,400-acre site next month for a mere fraction of the more than $5 billion it has spent on the facility. TVA said Friday it has set an auction date of Nov. 14 at 9 a.m. central time to sell its unfinished Bellefonte nuclear power plant. Concentric Energy Advisors Inc., a property consulting firm TVA hired this spring to market the 1,400-acre power plant site on the Tennessee River in Hollywood, Ala., will conduct the sale at the plant site. 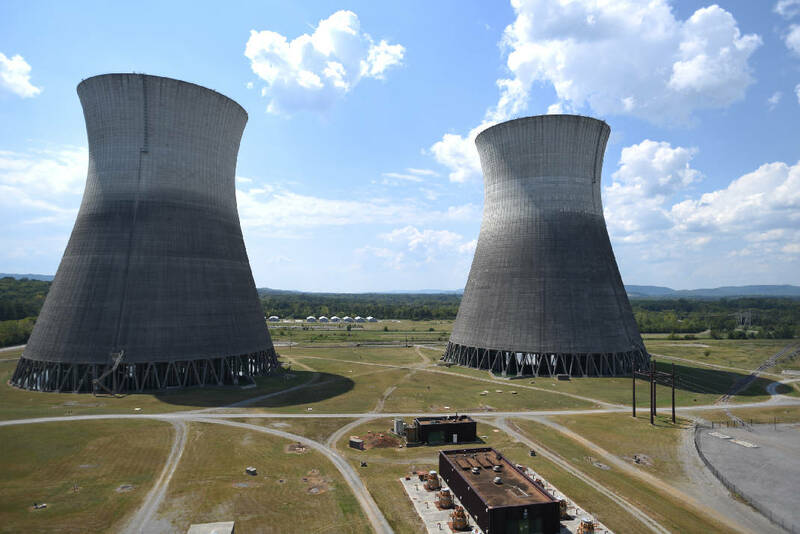 TVA directors declared the unfinished nuclear plant to be surplus property earlier this year — 43 years after construction began on the twin-reactor complex. TVA said in a statement Friday the "primary goal in selling the site is to provide the best long-term economic return to the surrounding communities." The minimum bid price is $36.4 million, which is the appraised value of the riverfront property, but the bids will be evaluated on both the price offered and the economic gains any sale would generate for the region. TVA has invested more than $5 billion in capital and interest costs at Bellefonte since work began on two Babcock and Wilcox reactors in 1973. Work was suspended in the 1980s when TVA's growth in power demand slowed and TVA determined it didn't need either of the 1,200-megawatt units. The site is not currently subject to any zoning regulations and TVA says the site could support a mix of industrial, commercial, retail and residential use. TVA spokesman Scott Fiedler said the utility and its sales agent are not disclosing the identities of bidders who have qualified to submit purchase proposals next month. It is unclear if any of the buyers are interested in using the reactor building, transmission yard and cooling towers to pursue any nuclear power generation. One possible bidder is the Nevada-based Phoenix Energy, which said it submitted a $38 million bid for Bellefonte last month. The company has proposed using Bellefonte for a new type of magnetic inductive power generation known as induction energy fuel conversion after investing a few hundred million dollars. But the technology and the ability to use Bellefonte for such generation at a cost effective price is still unknown. Because TVA does not anticipate needing any extra power that such a plant might generate, Phoenix Energy would have to beat the generation prices of other independent power producers to sell its power on the open market. TVA has previously written off much of its early investment in the Bellefonte plant, which TVA decided to give up on a decade ago to pursue next-generation nuclear designs. But after scrapping some plant equipment, TVA reversed itself in 2008 and decided to maintain the original plant for possible future generation. TVA's latest long-term power forecast prepared last year doesn't foresee the need for any more baseload power generation like Bellefonte for at least the next two decades. "Selling the property now is a smart business decision because TVA's 2015 Integrated Resource Plan shows that large base-load capacity is not needed for more than 20 years," TVA said in a statement. "Putting the property on the market allows future owners to provide maximum long-term economic value." Updated Oct. 14 at 11:38 p.m. with additional information.